This room is for those who have designed a complete layout for bots. To Comment, "A G1 Tactician Ironhide with Water gun"--"Blurr may evade ranged and have high CRIT rate and power gain"--etc.. There's already a Character Suggestions room where you can demand bots by name or pic. Pictures Not Allowed as it causes spamming. Just mention Name, Origin, Class, Ability set. We all know how that bot looks like. Try to comment as less possible to point out mistakes and flaws in Ability Set designed by someone. Ability Set include, at least, some base abilities, Special Attacks, Signature Ability. And some animation description (no GIF), how bot perform it's moves. Include Bot not released yet. Don't repost abilities of already Released bot. Passive : Exterior provided by Lab-Enhanced Transformium gives Megatron Passive 10-20% Armor which also reduces crit damage as well as 20-40% Bleed and Stun Resistance reducing their chance to trigger as well as Duration. Effectiveness of enemy Crit Damage buffs is reduced by 30-60%. When Enemy Evades or Dodges a Melee Attack: 60% chance to gain a 20-40% Armor for 7 sec. 100% chance to miss all ranged and melee hits, not affected by abilities that don't allow to miss attacks. Megatron get a 40-80% Attack Buff for 7 sec. A reverse slap followed by a burst flame from Fussion Cannon dealing 80% attack as burn damage over 4 sec. 3 Furious Strikes of Sword have 60% chance to inflict a 35% Armor Break. He transforms and crashes in you , then gives you some Sword Taste followed by A Power Charged Critical Fussion cannon blow which inflicts a 20-40% Attack Debuff for 7 sec. On Special Attacks : Megatron's Special Attacks transfer a passive Fear/Terror in their Spark for 5-8 sec reducing crit rate by 35-60% and trigger rate of Presicion and Crit Rate buffs by 60-80%. - Hun-Gurr's thirst for energon happens whenever the opponent's bleeding, Hun-Gurr is able to regenerate 0.5~1.5% health per second until all bleed effects expire, Hun-Gurr also generates 30~60% more power when he's thirsty! _Daze - Some Serious Smashes install Traumatic programming in the cerebral circuitry to slow their movements and miss attacks. _Determination - Prime's Determination urges him not to loose power and get stun. _Daze debuff reduces chance to evade by 'x' % ,having chance to miss their attack by 'y' % and reducing movement speed by 'z' %. It's x-y-z% Daze inflicted by Abilities. _Movement refers Sidesteps,Dash Back and forth, Attack (not their damage output) excluding projectiles. _20% reduced opponent's chance to evade. _Additional 2% reduction per every 5% reduction in enemy health. _Daze can't have more than 2 stacks, Stack with least remaining duration are purified to give Prime 10% power to allow new stack to work. _25% chance to inflict bleed for 25-45% attack for 5 sec. _Crit Hits can't be evaded or missed. _+20% Crit Rate against bleeding opponents. _While Armored, Crit Rate buffs of opponent are 75% less effective. _When Opponent dashes in Block, 15% chance to Shield Slap dealing 20% Attack as damage, inflict a 40-15-25% Daze and stun for 0.5 sec. _50% chance for Prime to be invulnerable for 1 sec ,gains unstoppable for 2 sec and increased 50% Crit Rate for next hit. _With Shield in front to Protect, Prime can't get a crit hit. _15% Chance for Auto-Block when hit. Auto-blocked attack has 100% block Proficiency and gives 20% of a power bar. _While dashing into Opponent's Dash, 30% chance to auto-block, 20% chance to break their dash and stun for 0.5 sec. _Stun are 45-65% shorter, any power draining abilities are 50-70% less effective, two or more stacks of power leaks are purified for 5-10% power. _Power lock are purified for 15% power. _Crit Hits have +30% chance to trigger the respective Abilities. _Unsuccessful special attacks return 20% of a power bar and 20% attack buff. Special Attack 1 : I am Optimus Prime! _Two Small Chops each with 45% chance to inflict bleed for 20-40% Attack over 5 sec followed by a Super Slash with 60% chance to inflict bleed for 60-70% Attack over 7 sec. Special Attack 2 : Daze Out! _Two Charged Shot from Shield ,then Prime come Rocket-Powered to give Shield Slap with 60% chance to inflict 50-20-30% Daze for 5-9 sec. _Then they are on knees, transform to gain some momentum and again for high jump for sword stab for 100% chance 70-90% attacks as Bleed for 10 sec. Signature Ability : Do you Forget WHO I AM ? _Bleeds and Daze: 3 or less stacks of bleeds and one stack of Daze can't be purified by bot ability or MODs. Purification resisted stack last 60 -> 30% shorter. Try not to add abilities in quotes. It just takes more spaces and is inconvenient to read. While reposting, remove [/'quote']' from comment . Anyway that's fabulous. Just don't reply to this. Leave a agree to this comment, to let me know you read this. Heavy Attacks : Fire a Shell a incredible Velocity, 30% faster and removes upto 3-5 Resistance buff of any type and has 30-50% Armor Penetration. Crit Hits inflicts a Defence Shatter Debuff for 5 sec removing upto 2-4 Armor buff and amplifying damage by 30-50%. +40% Armor Rating while in Tank Mode. On Opponent's Dash : WarGun in his chest a 20-40% chance to automatically shoot for 30-60% Attack Damage and stun for 1 sec. WarPath use CaterPillar tracks on his Arms to Tear the Opponent dealing upto 8 minor attacks each with 35% chance to inflict bleed for 30% Attack over 4 sec. Continuous shots of 6 Acidic Shells each with 40% chance to inflict 35% Attack as Acid Damage over 5 sec. Some Caterpillar Punches, followed by 4 Thermal Shells each with 60% chance to inflict 45% Attack as burn Damage over 3 sec. At Last, transform to shoot a Charged High Velocity Shell with 100% Chance to inflict 90% attack as bleed over 3 sec. -First Hit : Presicion Shell can't be evaded or missed ,has 30-60% increased Crit Rate. -Third Hit : Sonic Shell has 30-60% chance to Stun Oppnent for 1 sec. Electro-Laser : A Special Gun of ionized Laser can burn up the circuits. - 100% Chance to miss all ranged ranged Attacks. - Due to High Speed and not-so-strong chasis, He is very vulnerable to Basic melee attacks while Dashing. - Opponent's Melee attacks can break the Dash. - Blurr takes +25% Damage from enemy with Precision while Dashing. - Electro-Laser has 20-30% chance to inflict a shock for 20% Attack Damage and a Jam debuff for 5-8 sec reducing power flow by 25% and removing All Shields and preventing their Activation. - Crit Hits have 30% chance to stun for 1-3 sec. - Jam can't be stacked. - Blurr uses Shock to power his Electro-Laser reducing Shock Damage by 60-80%. - +15% Ranged Speed and +30% Ranged Damage for Each Shock active on him. - +20% Crit Rate and +30% Crit Damage for Ranged Attack for Each Shock. - Each Crit Ranged hits Purify one Shock and nullify one Power Gain on Enemy. On Opponent's Dash: 30% chance to evade the attack. Blurr may go from one corner to other and hit 6 super fast punches and kick on face with 60% chance to stun for 2-4 sec. Four Whirl-Wind Kicks rising little high (like G1 Bee). And Electro Shot for a Jam for 12-16 sec. Blurr runs across the battle- Hitting enemy about 15 times and creating uncountable images of himself. Confused and dazed enemy gets Stun for 4-5 sec. Then, Blurr uses most fierce setting of electro-laser inflicting a Permanent Jam. - 50-80% reduced repair effects when Jammed. - Power Drain of 2-5% of Max Power per sec while Jammed. - Drains 3-6% of Max Power on all Ranged Attacks. Is this room Allowed to work? "Hey there Commanders! We currently have a thread up meant for bot suggestions here. Since we already have a thread open on this topic, I'll close this one down. If you have additional questions, you're welcome to ask over on the thread linked above! Thanks!" -Magnetic Inducer continuously generates Electro-Magnetic Disturbance reducing 30-40% Damage and 100% Crit Rate of Energy Ranged Attacks. -Shock Debuffs temporarily suppress this effect while they are active. -Ranged Attacks grant no Power to Opponent. -Magnetic Inducer Cannon on Roof-Top shoots at Opponent. -Magnetism attracts all ranged attacks back to Opponent before they hit WheelJack. -Magnetism and being magnetized refers to being under 'Induction' debuff. -Magnetized Opponent attracts WheelJack increasing Dash Speed shrugging off impact of All melee Attacks. -Ranged Attacks would be attracted back ,anyway. -Magnetic Induction cause opponent to transform back into Original Form as soon as They transform in Alt Form, virtually causing transformation failure. -WheelJack shoots a ranged attack, and Throws Immobilizer just ahead of Opponent which unleashes a ShockBlast and inflicts a Shock for 50% Attack Damage over 5 sec and a 'Power Malfunction' debuff for 8 sec. -Power Malfunction decreases Power rate by 20-40%, effectiveness of Power Gain is reduced by 70-100%. -When Opponent with Power Malfunction tries to initiate a Special Attack, their Special Attack fails to engage and Power Meter is depleted to zero. -WheelJack fires three small missiles each with 60% chance to inflict a Burn for 40% Attack over 5sec. -He then charges his Cannon to launch a Magnetic Induction Laser which has 100% Chance to inflict Induction for 7-10 sec. -WheelJack transforms and drifts around opponent shooting with Induction Cannon 6 times (0% chance to inflict aything). -Then, he stands up and shoots a charged shot of Induction Cannon inflicting Induction for 10-12 sec. -Enraged Opponent tries to Shoot their 4 basic ranged and attracting them, each dealing 25-30% Attack Rating of Opponent. -WheelJack throws immobilizer inflicting Power Malfunction for 15 sec and Shock for 40% Attack Damage. -Heavy Attacks have 25% chance to Inflict 'Induction' to magnetize the Opponent for 3-8 sec. -Basic Ranged Attacks burn 2-5% of max Power. -Power Malfunction transfers 2-5% of Max Power of Opponent to WheelJack per second. -Passive Magnetic Disturbance has 10-20% chance to self-destruct the incoming Missiles. -Magnetic Inducer Cannon on Roof-Top shoots at Opponent which has +20% Speed. -Magnetic Induction cause opponent to transform back into Original Form as soon as They transform in Alt Form. -In other words, Magnetism causes Transformation failure. -30% chance to stun for 2-5 sec. -He then charges his Cannon to launch a Magnetic Induction Laser which has 100% Chance to inflict 'Magnetism' for 7-10 sec. -Then, he stands up and shoots a charged shot of Induction Cannon inflicting 'Magnetism' for 10-12 sec. -Heavy Attacks have 25% chance to Inflict 'Magnetism' to magnetize the Opponent for 4-8 sec. -Basic Ranged Attacks burn 3-6% of max Power. -Power Malfunction transfers 3-6% of Max Power of Opponent to WheelJack per second. -FaceGun : When Your Face is a Gun, Opponent's Every Argument is Irrelevant. -Special Damage : Increases Damage output of Special Attacks. -Burn : Delivers Heat Damage over Time. -LockDown's determination to kill the target allows him to Shrugg off all attack debuffs. -First Two Hits are Missile Barrage form Shoulders, each with 25-35% Chance to inflict Burn for 30-50% Attack over 3 sec. -Third Hit is a Charged Ion Gun Shot with +20% Damage and Speed, 20% chance to inflict shock for 20% Attack over 2 sec. -When Under 75% Health, this mode triggers for 5 sec. -Under 50% Health, this mode Triggers for 6 sec. -Under 25% Health, this mode triggers for 7 sec. -LockDown also gains Unstoppable for Half the Duration whenever it triggers. -During this mode, basic ranged attacks are UnBlockable FaceGun Attacks, +30% faster and +75-100% more damage. -FaceGun Attacks shrug off Opponent's Basic and Heavy Ranged ignoring Evades. -FaceGun Attacks have 100% Armor and Resistance Penetration. -Last melee hit is a FaceGun Slap with 100% Crit Rate. -Unsuccessful Special Attacks give 10% of Max Power. Special Attack 1: Grenade Assault---Target Locked, Blast it Up! -He throws a Grenade exactly where you stand, and blasts after about 1 sec. Dash Back or Sidestep twice to dodge. -When first explodes, He throws second. -Each Grenade has 80% Chance to inflict burn for 60-90% Attack over 4 sec. -Shoots two Ion Gun Shots each with 40% chance to inflict Shock for 4 sec. -Then He charges a FaceGun shot for 100% Chance to HeadShot dealing 90% Attack as instant damage as well as Bleed for same over 5 sec. -LockDown triggers FaceGun Mode for 5 sec. Special Attack 3: Locked Down---Once he Got you, just beg for a PainLess Death. -Shoots A Charged Ion Gun shot for 60% chance to inflict 60% Attack as Shock Damage. -Transforms and Hits Opponent Hardly, knocking 'em down. -LockDown goes to Opponent as they stand up, and Stabs his Ion Gun-Pincer to their Spark inflicting 100% Attack as Bleed and 20% Attack Debuff for 7 sec. -As Opponent tries to get out of this trauma, LockDown charges his FaceGun with 100% chance to HeadShot dealing 100% Attack as Instant and Bleed Damage over 7 sec. -Inflicts 30% Resistance debuff for 7 sec. -He triggers FaceGun Mode for 7 sec. -LockDown Gain 0.3-0.7% of Power for Each 1% of Health Opponent is missing at Start of Fight. -LockDown gains Additional 0.8-1.5% Power for Each 1% Health Opponent losses during Fight. -LockDown gain 50% Less power from above effects if Max Health of Opponent is Less than Max Health of LockDown. -LockDown can gain power again and again if Opponent repairs again and again. -LockDown gains passive +100-200% Special Damage based on Missing Health of Opponent. Bleed - Most Famous DoT Debuff. CyberToxin - A Program that Effects Cerebral Circuits. Stun - Stay still! I want to Attack! Evasion Lock - Name tells everything! -Transmetal II Exterior provides 50% Crit Damage and Bleed Resistance. -Heals 5% of Max Health at start of a fight. - She performs a seven hit combo , 5 spider-pincers and 2 final kicks. - Spider-Pincer attacks have 25% chance to inflict Bleed for 30-60% Attack over 3 sec. - 20% chance to stun on Kick for 1-3 sec. - Shoots Web-Balls with 20% chance to inflict Evasion Lock for 3-7 sec decreasing enemy's chance to evade by 100%. - Evasion Lock refreshes if Opponent has active evade buffs at the time it would elapse. - 40% Chance to inflict CyberToxin for 40-80% Attack as Toxic Damage over 4-8 sec while she bites the target. - CyberToxin stuns the target for 4 sec if they evade any attack. - There is no known cure for CyberToxin, so it can't be Purified. - Heals 50% of Damage Dealt. - Arachania performs two kick and transforms to shoot a Web with 60% chance to stun for 3-6 sec. Special Attack 2 : Not too Shabby! - Arachania jumps and kicks enemy with 70% chance to stun for 4-5 sec. - Then performs slicing attacks with her Arm-Pincers 4 times each with 60% chance inflict bleed for 40-70% Attack over 5 sec. Special Attack 3 : BlackArachania Maximize! - BlackArachania performs some Pincer moves each with 40% chance to inflict Bleed for 30-60% Attack over 4 sec. - She transforms and grabs enemy with web and rotates ferociously to give them a sky ride followed by Super Hard Crash Landing with 100% chance to Stun the enemy for 4 sec and give them a 'Evasion Lock' Debuff for 10 sec. Signature Ability : Vicious Arachnid! - While Enemy suffers from Evasion Lock, Her Crit Damage increases by +50-100% For each Stack. - While Enemy is Stunned, Her Crit Rate is increased by +20-40% for each stack. - 'If' the Debuff have more than 3 stacks, their effect is not combined ,i.e, Above effects can be combined for Max stacks of 3. X% of a power bar at start of fight. Experience - More wars you engage in, more you get the Knowledge and Wit to survive. Water Gun - It's just not limited to Water. -Being veteran in Wars, IronHide's Experience allows him to tackle most of severe conditions reducing effectiveness of non-DOT debuffs by 30-60% and DOT debuffs by 10-30%. -Attack and Crit Rate Debuffs are converted into the Respective Buffs of half strength. -Experience Grants knowledge to break through Defenses, granting 25-45% Armor Pierce ignoring their additonal Passive effects. - IronHide shoots Acid solutions having 20-30% chance to inflict ACID dealing 30-50% attacks for 6 sec and corroding a resistance buff every 2 sec and armor buff every 3 sec. - +30% Crit Rate and Chance to inflict Acid against Unstoppable enemy. - +60-100% crit damage on Corroding Enemies. - His Heavy Vehicle mode has 15% Chance to be Unstoppable. - Two Punches Each with 60% Chance to remove one Melee and Attack buff, and a kick with 100% chance for same. - Kick followed by Water Gun. -40% chance to inflict a Mechanical Freeze with 30-50% chance to stun for 1 sec on Dash Forwards and cause failures to transform for 5 sec and inflict 0.5 sec stun on expiring. -Vehicle Mode smashes a 20% Armor break for 10 sec. Then IH shows what his Water Gun can do. - Acid solution corrodes all resistance and protection buffs dealing 25% attack damage over 2 sec. - Feeling Hot? Nitrogen powered Shots cools down to stun for 3 sec and gives a Mechanical Freeze for 8 sec. -Mechanical Pain deals 20-50% Attack as instant Direct pain damage when Opponent Transforms and 20-40% chance for Transformation Failure And deals 5-10% Attack Damage when they Dash back or forth and SideStep. ArmorBreak - Having Armor is illegal. Burn - DeBuff which helps in Harsh Winters. - This SparkLess Bot shrugs off all CritRate and Attack DeBuffs. - 15% chance to nullify a Attack or Melee Buff. - Fires Missile from his Blaster, 20% Chance to Burn for 20-40% Attack over 5 sec. - If Opponent has a Armor, 40% Chance to inflict a 30-50% Armor Break for 8 sec. - 20% chance to refresh current Armor Breaks. - Splits in Particle Pieces, Ignores all Attacks and Purifies Bleeds. - Pieces form Truck (Second Chance to Stop Him), Shot missile with +50% Crit Rate. - Ranged Attack Fires an Ion Charge Shot with Double Damage and inflict Stun for 3 sec. - 50% Chance to inflict 60% Armor Break, whether it has Armor or not. Special Attack 1 : Galvatron Functioning---Well, Better run away! - He punches and kicks the enemy with 80% chance to nullify a melee, ranged or attack buff. - He shows blades in his lower Arm and slices once for 60% chance to bleed for 40% Attack over 2 sec. Special Attack 2 : Missile Rain---No Umbrella can save you now! - Fires 5 missile with 40% chance to inflict 40-80% Attack as instant Burn Damage. - Fires a Charged Ion shot to nullify all Armors and inflict a 40-60% Armor Break for 10 sec. Special Attack 3 : I AM GALVATRON---Feelin' Wet? - Fires an Ion Shot to Remove all Armors and inflict a 50-70% Armor Break for 10 sec. - Transforms and Ram into Opponent to knock down the enemy and they stand on knees. - He transform back and Smashes a reverse-kick on their face and inflict Armor Lock for rest of fight. Signature Ability : THAT'S WHY I HAVE NO FEAR!---When messing up with A Spark-Less bot, Don't Expect even an Atom of Mercy! - Coverts Each CritRate and Attack DeBuff into a 10-30% CritRate buff and 30-90% Attack for 7 sec, respectively. - Burning Opponent's Ability Accuracy of DoT effects is reduced by 30-90%. - Armor Broken Opponent's OVerall Ability Accuracy is reduced by 40-70%, doesn't stack with that of Burns. - Heavy Attack too have 20-50% chance to inflict ArmorBreak against Armored Opponent with equal efficiency as one by Ranged Attacks. Are these characters coming to game in the up coming months? 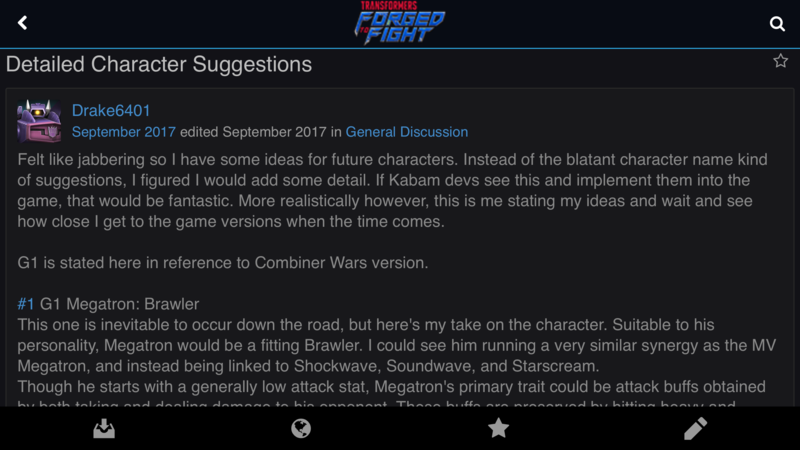 @Bumblebee254 , well we create ability sets, so if kabam decide to make a bot, they already have ready set, with already made sets, the bot has more chance for kabam to make it to game. Please note if anyone has any question, don't quote any ability set, instead just comment it out to reduce the forum length. Stun - Stay There!, I'm coming! Precision - Well, You are not allowed to evade! - Crit Hits have 20% Chance to stun for 2-5 sec. - 15% Chance to gain Precision increasing Crit Rate by 15-30% and decreasing Enenmy's Chance to Evade by 25-45% for 5 sec. - Strike with claws having 30% Chance to bleed for 40-60% Attack over 4 sec. - +20% to inflict Bleed on Crit Hits. - Charges at Opponent like Superman with 75% Chance to Stun for 4-6sec. - Shoots 10 Ranged Attacks with 30% to bleed for 40-70% Attack over 4 sec. - +20% Chance to Bleed on Crit Hits. Special Attack 3: Airazor Maximize!---Comes from direction of Sun...so that you can see it last time! - Opponent tries to shoot ranged while Airazor transforms and flies awya to disappear. - Then, She comes from high sky and lift Opponent up throws them up,transforms and shoot 15 Ranged Attack mid-air. - Shoots 10 Ranged Attacks with 30% to bleed for 40-70% Attack over 4 sec, +20% Chance to Bleed on Crit Hits. - While Opponent is falling, she kicks twice to make it happen faster. - Gains Passive precision reducing Opponent's chance to evade by 100% on all Ranged Attacks. - Gains 10-25% increased Crit Rate and 25-75% reduced chance to miss on Ranged Attacks. Rex Charge - Amplifies Damage done by T-Rex Laser. - Each Rex Charge provide +5-10% Ranged Damage and Armor Penetration, and +10-15% Crit Damage for Rex Laser Attacks only. - Gives a Tail Smash with 15% chance to 20-35% Armor Break for 4 sec. - If Opponent is not in Hit Range of Tail Smash, Then he uses Rex Laser. - Tail hits have 40% chance to convert an Armor Buff into a 20-40% Armor Break for 6 sec. - Smashes Opponent with three Tail Hits with 60% Chance to Inflict 30-50% Armor Break for 6 sec. - Hits two tail Smashes for damage equal to five basic melee hits. - Transforms and gives a furious tail smash and grab opponent's leg with mouth and Smashes them here and there. - Shoots Powerful Rex Laser with +20% Crit Rate. Signature Ability : Yeeesss!---Sounds Villainous, Right? - Rex charges last 2 ranged attacks. - Gain +20-50% Attack Buff for Each Armor Break inflicted for 7 sec. - Gain +10-20% Crit Rate Buff for Each Armor Opponent Activate for 8 sec. - Till Predacons Rule - Tarantulas/Scorponok: +8% Power Rate for all Predacons and +6% Attack Rating in Alliance Missions. - Beastial Fury - +25% Power Rate for 7 sec on Heavy Attacks to all Beasts. If there are two or more beats on team, they refreshes their active buffs and successful Heavy Attacks refresh All Non-Damaging Debuffs on Opponent. _Buffs exclude Power Gain, Heal, Feral Strike,,Debuffs exclude stuns. - Inflicts a chemical debuff when 100 charges are applied. SP2: Since when did Perceptor become so dangerous? - Different effects are applied based on current ammo type. Power Rate - I need more Power! Shock - Helpful during Power Cuts! - -35% Power Rate when getting Attacked. - LaserBeak's Lasers have 30% Chance to Shock for 30-60% Attack over 3 sec. - 15% Chance to Stun for 2 sec and 30% to inflict Interference reducing Ranged Speed by 20-40% for 7 sec. - Inference has no effect on damage. Special Attack 1: Laser Charge---Laser Beak Charged Up! - SoundWave kicks Opponent and LaserBeak fires a charged Shot. - Charged Shot has 100% Chance to Shock for 70-100% Attack over 5 sec and 50% Chance to cause Interference for 10 sec. - Shoots 7 Continuous Shots with +25% Crit Rate and 45% Chance to Shock for 50-80% Attack over 3 sec. - Gains Power Rate restoring Power Rate to 100% for 5-7 sec. - +0.1 Sec to Power Rate Duration for Each Hit in Combo Meter. - Duration doesn't decrease if Meter gets reset nor increases if Meter increases after Power Rate is activated. - While SoundWave is kicking and punching from front and laser beak does his part from back side. - LaserBeak shoots 10 Continuous with +30% Crit Rate and 55% Chance to Shock for 50-80% Attack over 3 sec. - Gains Power Rate restoring Power Rate to 100% for 6-8 sec. - +0.2 Sec to Power Rate Duration for Each Hit in Combo Meter. - When Dashing Back or Forth and Heavy Attacks, Gain a Shield reducing 40-80% for 4 sec. - While Shield is Active, Combo Meter can't be reset and Crit Damage is reduced by 90%. - Brain Drain- ShockWave - ShockWave has +20% Power Rate against Opponent per stack of Shock. - Espionage Specialist - Mirage, Bay-Bee, GeewunBee - Special attacks are 70% less likely to trigger abilities. - Sky Assault - Wasp, Scream, WindBlade, Airazor - +25% Anti-Evade. You need just little skill of Dodging and sidestepping to finish fight without giving opponent 1% of power. But if your opponent if aggressive, they can easily overtake you in power race,and you have but a short meant to protect combo meter as a defense. The shield is meant to be prevent combo meter from reset during opponent's counter-attacks while dashing and heavy, so you can prolong sp2-3 power rate. It will take a little long but if you patiently mange to sp2, fight can be totally in your hands, All you need is a little NINJA SKILL. Armor Pierce - You have an Armor!? -At 20 Hits, Gets Nothing else! - All melee attacks have 30-50% Chance to nullify any one Melee, Ranged or Attack Buff. - Increases Crit rate for Melee Attacks by 15-25%. - Ignores Crit rate Debuffs or any kind of crit resistance. - Crit Hits have 100% Chance to Bleed for 35% Attack over 4 sec. - Crit Melee Hits have 60% Chance to inflict 25% Armor Break for 5 sec. I have no idea about Animations for Special Attacks! - +75% Crit Damage for 5 sec. - Ignores any kind of armor or resistance active. - When Combo Meter is reset, the buffs last additional 4 sec. - +15-35% Passive Attack Buff for Each Combo-Buff Active. - Till Maximals are One - Airazor | Cheetor - +8% Attack Rating for All Maximals; +8% Melee Damage in Solo Missions. - Maximal Brothers - Primal | Rhinox - +8% Armor for all Maximals; 15% reduced Ability Accuracy of Opponent in Alliance Missions. - Role Models : Incoming - Primal - While Nullifying a Buff, Gains 5% of Max Power. - Role Models : Outgoing - Primal - Primal gets +15% Melee Damage and +8% Armor. - True Love : Mutual - Airazor - Starts fights with 75% of a power bar and 15% Increased Ability Accuracy. - Combo Masters - Drift | Jazz - +0.5% Passive Attack increase for each hit in Combo Meter. Resistance Break - Something New Right? -Semi-Transmetal Exterior provides 25% Resistance to Power Drain abilities. -Crit Hits of All Explosive Blade Attacks have 100% Chance to Burn for 40% Attack over 5 sec. -Gains 10-20% Special Damage Buff for 8 sec for each buff. -Doesn't trigger on activation of melee, ranged or special buff. - Flies and dives and attacks with claws in his feet. - Throws two explosive blades. - Gains +25% Crit Damage buff for 10 sec. - Throws 6 Explosive Blades and Dashes to give sword slash. - +30% Crit Rate for Ranged Attacks for Duration of this Attack. - Crit Sword Slash bleeds for 50% attack over 5 sec. - While Opponent tries to stand, Silver throws 12 Blades to stab in ground forming circle around them, caging them. - Blades explode one after one continuously with +20% Crit Rate. - Strong: 15% Chance to take no damage from a Basic Hit while this chance is 7% for special hits. - Fast: +15% Ranged Speed. - True Love - BlackArachania : Mutual - Starts fights with 75% of a power bar and 15% Increased Ability Accuracy. - Code of Honour - Dinobot | Tigatron - Up to +25% Passive Attack increase Based Upon Opponent's Current Remaining Health Percentage as long as Opponent's Remaining Health Points are more than theirs. Use Sp1 when it's about to fill second bar, as 10 sec isn't enough to fill two bar from start and Combine Crit Damage buff with Sp2 high crit rate. When duped his ranged attack won't be slow like Ironhide ,also not too fast like Wasp. All you have to do is not to have: Armor Breaks, Attack Buffs and Attack Debuffs. If you think Crit Rate is quite for sp2 to throws 4-5 burns easily, well, isn't he a demo? Power Store - This Sneaky Clever rat doesn't let his power go waste. Shield Break - Shield Manipulation is a serious Crime! - Transmetal Exterior provide 10% Energy Resistance and 100% Power Drain Resistance. - Crit Hits have 100% chance to remove a shield and inflict 100-140% Attack as shock damage over 3 sec. - Suffers no damage mitigation by Shields. - 30% chance to inflict Power Break for 5 sec reducing Power Flow by 20-40% and effectiveness of Power Gain/Rate buffs by 60-100%. - Unsuccessful Special Attacks return 10-30% of Power Consumed while Initiating Special Attack. - Two kicks and a LandMine Explosive. - 60% Chance to burn for 25% Attack over 3 sec. - 60% Chance to Stun Power Broken Enemy for 2 sec. - Turns Backwards and Shoots 6 Shots with Style. - Every Hit has 100% chance to remove a shield and inflict 100-120% Attack as instant shock damage. - Each Hit Drains 10% of a Power Bar. Special Attack 3: Wanna Play Chickens? - Transforms and Crashes into opponent burning up tyres. - Maximizes and Shoots with gun and throws several LandMines and uses every weapon he has. - 100% Chance to burn for 60% Attack over 4 sec. - Inflicts Power Break for 8 sec. - While they are Power Broken, Power Gains of Opponent gives same power to Rattrap instead of Opponent and Rattrap also gets +20-40% Power Rate. - Heavy Attacks have 20-50% Chance to steal any buff with Power Gain effect for same effectiveness and duration. SharpShooters - Mirage | Arcee | Hound | Airazor - +20% Crit Rate for Ranged Attacks. Weapons Specialist - Mixmaster | Hound | Rhinox | Ironhide - +9% Damage to Damaging Debuffs and +x% Attack Rating in AMs. SpeedChasers - Mirage | SideSwipe | Cheetor | HotRod - +x% Attack Rating for Next Attack when Dodging Opponent. Bitter Bromance/Rival Friend - Dinobot - +x% Crit Damage. Take any bot with no Power Gain and Shields and avoid getting his with his heavy or special 2. However, if you get hit, you can still be lucky not to get Power Break, the buff around which his sign revolves and is major strength of Rattrap. His only defense is miss ranged by heavy. His Power can't be drained but can be locked or simply confuse him to waste specials. And SoundWave and Rhinox would be the Suicide Option. Rattrap can also steal Heal of ratchet by his his sign as it has power gain effect too. So, do a Power Break on soundwave, let him heavy you if you can afford, and he'll generate power till he fills 2 bars and power will be taken by rattrap so he'll never fill 2 bar as long as he's power broken. Ratchet may heal but he'll never gain power while he's power broken. Signature Ability: Let's Say Go! - Star Saber is always ready for battle! Even when severely wounded. Star Saber's attack rating is increased by 20~50% when he drops below 40% health. Star Saber's crit rate increased by 15~25% when dropping below 20% health. This ability cannot be affected by Assassin mastery. - The V-Star provides Star Saber his weaponry and a 5~7% passive armor. Star Saber passive reduces the opponent's crit rate by an 8~16% chance when armored up. - Star Saber's spark burns with a passion for peace and justice, allowing him to increase his crit rate by a 10~15% and crit damage by a 40~60% against all Decepticon opponents. - Star Saber passively reduces Decepticon opponent's offensive ability accuracy by a 10~12% chance for each active bleed debuff they suffer. - 40~50% chance to cause bleed, dealing 36~42% attack over 6 seconds. Bleed lasts 0.5 seconds longer for each active bleed effect on the opponent (1 stack of bleed already lasts for 6.5s). Bleeding opponents cannot fill their 2nd bar of power, if they have more than 2 power bars, their power will be drained. - Star Saber's precise attack cannot be evaded. - Deal 20% more damage for every active bleed effect on the opponent. - Nullifies all Power Gain or Power Rate buffs. - Drains 5% of opponent's max power for each bleed debuff they suffer. - Does not trigger Backfire. - Gains 5% of max power for every active bleed debuff on the opponent. - Doubles the amount of bleed debuffs on the opponent. - Gains a permanent True Strike buff, ignoring all evade, armor and resistance effects.